← Adopted children don’t have family stories? Memorial Day: Where’s the party? Memorial Day weekend is here and I’m celebrating! My dad has a milestone birthday, a nephew graduated 8th grade, and the biggest celebration is that my young wandering niece surprised us by returning home after ten months abroad, and I’m at my sister’s house to help welcome her. We are thankful for blessings and joys large and small. I suspect most people have fallen into the belief that Memorial Day is for parties in honor of graduations, summer’s arrival and the opening of the public pool. Some, though, will also visit a cemetery to put flowers on the graves of beloveds who have passed on. Some will remember the true meaning of the day and place a flag outside their door or even set a flag at the grave of one who died in a war. I did put up our flag before one daughter and I left to visit my side of the family for the celebrations. More important, I shook the hand of a young veteran at church this morning. I suppose ignoring the true meaning of Memorial Day and saying it celebrates the beginning of summer is no different than ignoring the meanings of Christmas and Easter and concentrating on presents and candy. We see plenty of holidays reinvented to satisfy personal purposes. 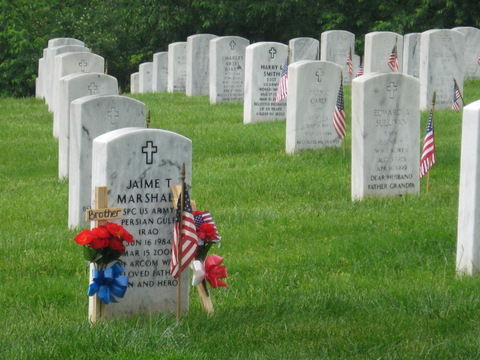 War veterans and their families are undoubtedly unhappy, even angry, to see any casual disregard of Memorial Day’s purpose. They, after all, gave up a part of their lives. Fortunately, in many areas the Boy Scouts and their families gather to decorate the graves of war veterans. If you have never seen the lines of flags set out over thousands of graves in a military cemetery, it is truly a heart-warming and heart-wrenching sight. Seeing all those lives given to the ugliness of war is like a punch in the stomach, yet there is a chest-swelling pride in seeing all the men and women who stood tall and strong to defend their country and even others far away . I doubt anyone could be immune to feeling chills—or tears. This Memorial weekend, remember to hug a veteran and have a moment of silence for those who lost their lives. Remembering is all they ask. This entry was posted in honoring veterans. Bookmark the permalink. 2 Responses to Memorial Day: Where’s the party? I followed your link to read this splendidly written about this day… Down to the thousands of flags for those buried there who served our country – along with their family’s worrying about their well-being. I do think about the fallen…and their families. Thank you, Koji. My heart is squeezed reading your beautiful posts about Memorial Day.